On a short trip to Paris last weekend, naturally one of the ‘must see’ places on my list was Sephora’s flagship store on the Champs Elysees. Forget the Eiffel Tower, the Notre Dame, the Louvre... Sephora was what got my heart beating faster! I’ve been to a few Sephora beauty stores in New York but nothing comes close to its Champs Elysees emporium in Paris – it was absolutely huge but meticulously organised with row after row of units boasting innovative, exciting beauty brands. If you stand at the entrance and look into the store, you can’t even see where it ends. 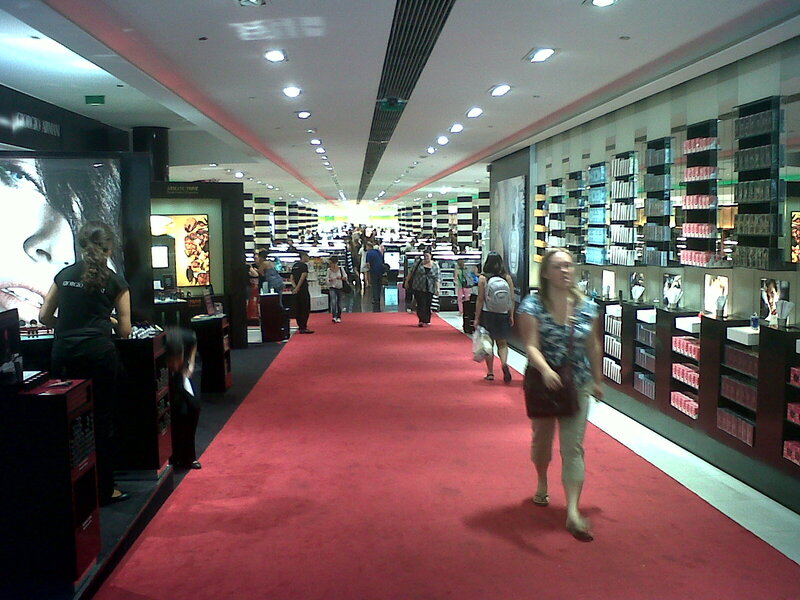 When I was there a guy at the entrance turned to his friend, pointed into the store and said “all make up!” incredulously. I thought that just about summed it up nicely! I think Sephora is a clever mix between a department store and a chemist, combining a true beauty experience offering niche and premium beauty brands within an accessible format without overbearing assistants. 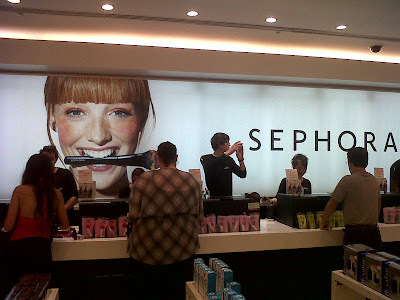 Sephora’s store concept excels at encouraging people to try out the products and experiment with them – there are ample testers (that aren’t completely ruined) and mirrors, plus cleansing lotion and wipes to remove the make up once you have tested it. It still baffles me that any store that sells make up doesn’t provide these simple necessities for testing. On a recent visit to the Boots store at Piccadilly Circus, I couldn’t believe how ruined many of the testers were (even the ones on the Benefit counter, which had a dedicated assistant available – how she didn’t notice and replace the mangy testers is beyond me). Other times, in other Boots stores, when I’ve wanted to test out a sample I’ve had to hunt for a unit that has a mirror available. And then when I have tested make up all over my hands, not having any cleansing wipes available to remove it puts me off trying out anything else. LVMH-owned Sephora popped its head up in the UK market briefly between 1999 and 2005 before closing all 9 stores, and I have always wondered why the concept didn’t work in the UK. I’ve been trawling the internet to try and find out why, and it seems there is very little to be said on the subject: in the articles I found, Sephora spokespeople refused to comment, and in forums many people commented on the fact that they never receive a response when they try to contact Sephora. From what I could find, Propertyweek.com attributed its closure to soaring rental costs, while comments on forums suggest that the out-of-town store locations, a lack of new brands and a lack of attention to detail in-store let down their UK stores, so perhaps it wasn’t done in the right way the first time round. Or perhaps it just wasn’t the right time and UK consumers weren’t ready for this style of beauty experience. The beauty market between 1999 and 2005 was quite different then and maybe now, with the surging interest in niche, innovative brands, the demand for an enhanced shopping experience and the consumer’s increasing knowledge of beauty products, Sephora could now succeed in the UK. But shops or no shops, given the amount of love in the UK for Sephora, why on earth doesn’t its website deliver to the UK? In my opinion they are losing a huge amount of potential, very easy business. Well said, Jenni! I've been puzzling over Sephora for years too. When they originally launched in the UK, I think they were unprepared for the strength of Boots and the three big department store groups. It's a totally different market to either France or the US, or for that matter any other. They're not the only beauty retailer to get their fingers burnt in the UK market. Many years ago, German Douglas thought they could crack UK beauty, but failed miserably. As you say, the market is changing and I've heard that Sephora is thinking about re-entering the UK. They should definitely build up loyalty in advance through their website. Do you think they'll take any notice of this free advice?? I cant see sephora coming back to UK soon. Hi Rakesh, thanks so much for your comments, I too was surprised of the M&S rumours - a very odd fit indeed! 1. A customer can return a product at ANY time for a FULL refund. If the product has been 3/4 used and they just "don't like it" - back it goes! 2. A 24 hour phone helpline with a trained sephora rep to talk them through products and brands - and take the money over the phone. Thanks so much for your comment Alex, I didn't know that this was the level of service Sephora offered - crazy! I think a 24 hour phone line is a great idea, although I'm sure this would be a logistical nightmare and I'm not surprised UK stores don't offer this. So still no news of Sephora ever returning to the UK? I remember going to the Sephora store in the Merryhill shopping Centre Dudley. They did make a mistake though of assuming everyone was going to use the big shopping malls every week. This is not America as most of us prefer to go down the local high street in our own city! You'd think they would have done some research on consumer trends in the UK before opening their stores. Also what made me laugh was I couldn't really see the UK adopting the same policy as the US in allowing customers to get full refunds on products they've already used! When I go to America I usually hit the Sephora stores downtown San Francisco or at it's airport. The things you have to do! It is a shame though how they could have made products available through a website for UK customers, they would have some serious business. Just been discussing this and looking for info on the demise of Sephora in the UK and came across your article. I remember the shops when they opened - I was really excited as my brother lived in Paris at the time and I loved the Champs Elysees store. They were a total disappointment! I think I visited three when on business trips and they were all a real mess, no real stock (I remember countless coloured bath pearls and little else) and not at all organised. I wondered at the time whether they were run on a franchise rather than from head office as they seemed so different to those in France and they closed down fairly quickly it seemed. I agree that the monopoly, at the time, of Boots may not have helped either. At least nowadays Superdrug and others have grown and may have paved the way for a Sephora like store again. I also can't see the well known returns policy happening here! I think that is something that is peculiar to the US rather than to Sephora, as I know other stores have the same policy there. Really can't imagine it here, it would be great though! I have no idea why they haven't launched online here though - using the US website is difficult and expensive, a lot of the products aren't available to buy (to be shipped to the UK) and you can use none of the promotions... even though they still persist in sending you countless emails about them! Friends used to use a shipping service so that they could have the full benefits but they put a stop to that last year and won't accept orders to shipping addresses anymore... they really aren't laying the groundwork for a friendly reception with beauty addicts here! Boots used to own Sephora (I remember going to the old style Sephora shops in the mid 80s and finding Boots branded products for sale) so I doubt that Sephora were unaware of the Boots presence in the UK high street. I do remember a 'proper' Sephora in London but it was empty every time I went, and nothing as lovely as the Champs shop!